Scrangie: Starting off Konad week! Okay, Konad Week got off to a very late start. New collections take precedence over old stuff since they're more useful if they're posted before or at the same time they're released... So Konad had to wait a couple days. I'll make up for it by carrying it into next week! Anyway, to start things off, here are some random pictures of me playing with Konad plate m70. I've discovered a few new favorites! My goal for this week is to review one or both of the Coraline Konad kits, possibly review my prize from the OC Nail Art contest (the Konad Salon Pro case!) and post a few pictures of Konad designs on my nails. I've been trying to do a Konad tutorial but I keep messing it up and starting over... I need a second person to take pictures while I'm doing it! I love the first photo there! I'm pretty sure I have that plate... must try that out! the skittled one is amazing! 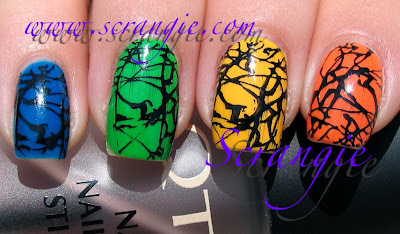 I saw it recently on nailgal! I'd happily be a photographer for you! say the word! I was given the deluxe kit for my birthday, and I should pick it up tomorrow, very excited to try it out! I love that first photo! I think that photo right there has convinced me that I need to get Konad. I can't wait to see more!!! Ohh love that - it makes me think of the 80s - but not in a bad way! Looking forward to seeing what you've got in store for us. 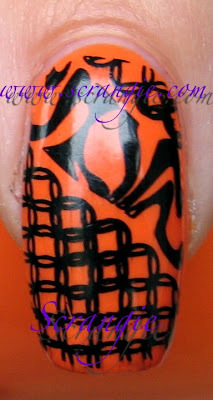 Now that my nails have left the "nasty and stubby" building...I NEED Konad...it looks like so much fun! M70 is on my wish list. The paint swirl skittles is a dynamic design. I love how it can be achieved with the Konad without the Jackson Pollack textural approach! The Coraline sets are my favorite thing from Konad! I can't wait to see what you do with them. Scrangie, I dearly wish you would post a tutorial because Konad scares me. So I'm going to make the suggestion that your webcam could take pictures while you paint. You'd only be able to do one hand at a time, but maybe that could still work? The plate sounds so cool, I love that design! Can you name the polishes you used? They look so lovely together. That is so cool!!! Konad is super-cool. One day I'll get over my fear and dive right in! The crackled effect is very cool! I really love that multi-colored splatter one! So beautiful! I love the first pic! What polish are you using as the base colour in that pic? These are AWESOME! I need to give Konad a try. I'm so intimidated by it!!! Thanks for sharing! The skittles hand is gorgeous! Love the second one also. This is going to be an exciting week.